A successfully quilted top has a great deal to do with how the fabric stretches as it is loaded onto the quilting frame. The backing is attached to a pole at the top and bottom edges and rolled tight. The top is attached to a separate pole and rolled tight. A well constructed and squared top and back will stretch equally top to bottom and side to side, and will unroll evenly as the quilt is quilted. A less carefully pieced top or a bottom not squared will sag in places resulting in tucks and folds, causing frustration for the quilter and a less than happy owner. Following are tips for a satisfying ending for everyone. Backing and batting must be at least 4” larger than the top on all four sides. Make it 5” for a king. To keep the sideways tension even, the backing is pulled tight with clamps. On a too small back, as the quilting machine nears the left or right edge of the top, it may hit the clamps from underneath and cause a bobble in the quilting. Remember the top and back are rolled on separate poles. A pieced top (especially with biased seams) will stretch more than the solid backing. By the time the bottom of the quilt is reached, those extra inches will be less. Nobody wants to find the top is now longer than the back. A solid wide back is preferred, but if you piece it, make sure your seams are ironed open. That way there is less rolled bulk on the pole and a more even tension. Make sure the back is squared and edges are even. Trim loose threads. If you piece the back, cut the selvages from inner seams - again a stretching issue. Selvages may be left on the top or sides. If you need to add just a few inches to the back to make it wide/long enough, add the strip in the center, not the edges. If you add it to the edges, the seam may wind up right where you want to sew your binding making it lumpy and hard to work with. When you buy wide backing, ask them to tear the fabric. Cutting fabric folded that many times creates a zigzag edge. Also, tear the selvages off. The selvage is usually woven so tight it stretches differently than the rest of the back. Press your seams well and consistently as you piece. Twisted seams may look lumpy after quilting. It may be necessary to press some seams open. For instance, an eight pointed star will have a lump in the center 16 layers thick if all seams are pressed to the side. If your home machine won’t sew through it, the quilting machine won’t either. Sewing around the center may result in the “Dolly Parton” look. If your top has many pieces along the edge, it’s helpful to “stay stitch” 1/8 inch from the outside edge. This will minimize unwanted stretching and prevent seams from coming loose at the edge. Sew embellishments such as buttons, bows and sequins on AFTER quilting. Chances are they’ll be in the way and your quilter will snip them off. Then you’ll have to sew them on twice. Tops with bias cut pieces or many pieces are notorious for wavy or rippled borders. DO NOT simply cut strips and sew them on the sides of your quilt tops, hacking off the leftover fabric. Although this is a technique found in several books (We suspect the author does not do her own quilting) this method is almost guaranteed to get you wavy borders resulting in pleats in the quilting. Measure the borders to fit the quilt. Measure across the length of your quilt top in three places at least 8” from the edge. Find the average of these three measurements then cut the border to fit that measurement. Do the same for the width. Apply borders to the longest side first. Pin from the center out, easing as necessary. Sew. Repeat with remaining sides, taking into consideration cornerstones or mitered corners if applicable. Press the border seams in the direction that will help your quilter do the best job for you. Press the seams away from the more solid side. Quilters stitch-in-the-ditch on the downhill side and the stitches will be less noticeable if sewn on the side that does not have multiple colors. Trim loose threads from top and back of quilt with scissors and lint roller. These may show through the fabric when it’s far too late to remove them. Your quilter won’t mind snipping a few threads, but she won’t bother if the whole top is hairy. Press folds out of the fabric as these will not “quilt out”. If the top or back has a definite up or down, pin a piece of paper to it indicating which direction is up. Quilters prefer you fold the top and back separately rather than together. Most quilters prefer to use their batting. If you want to provide your own, check with your quilter before you buy it. Some batting is hard to work with and won’t be accepted. If you have any questions at all, call your quilter. She wants to enjoy working on your quilt and wants you to love what she did with it. Alternate blocks (setting squares) - A block arrangement in which pieced or appliqued blocks are alternated with plain blocks. Applique - The process of sewing small pieces of fabric onto a larger piece of fabric by hand or machine. Assembly line piecing (chain piecing) - Piecing identical units of several blocks at the same time, instead of piecing each unit and completing one block at a time. Bargello - A method of strip piecing with repeated fabrics, from light to dark, resulting in a pattern resembling scallops, waves, chevrons or rosettes. Block Units - The small pieced sections or subdivisions of a block. Border Corner Squares - The square that is joined to the end of a border and positioned at the corner of the quilt. Borders - A pieced strip of fabric joined to the edges of the inner quilt and used to frame it. Broderie Perse (French meaning “embroidering chintz”) - printed motifs cut from chintz and appliqued to a background fabric. Celtic Applique - An applique technique using bias strips to produce complex, curved geometric designs. Chain piecing - (See assemble Piecing). Charm Quilt - A patchwork quilt, usually one-patch, made of many different fabrics, no two exactly alike. Comforter - A bed covering that has a thick filler and is tied instead of quilted. Corner Triangle - A triangle that fills in at the corner of a diagonal-set quilt. Diagonal Set - A block arrangement in which the sides of the blocks run at a 45 degree angle to the quilt sides (See On-Point). Echo Quilting - A type of outline quilting most often used on applique quilts. The applique motif is first quilted in-the-ditch. The next line of quilting is parallel to the first, approximately ¼” away, the third line the same distance away, and so on. English Paper Piecing - A method of hand piecing in which fabric shapes are basted over paper templates and whip stitched together along their fabric edges. Fancies - A general quilting name for elaborate quilting designs. Fat Eighth - A 9”X22” fabric piece. Fat Quarter - An 18”X22” fabric piece. Finger Pressing - A technique of pinching fabric between your fingers or smoothing a seam with your fingernail to form a temporary crease. Foundation Fabric - A base piece of fabric onto which smaller fabric pieces are stitched. Foundation Piecing - A method of sewing small fabric pieces onto a foundation fabric, the foundation fabric remains in place. Fussy Cut - A technique by which a clear template is positioned over a selected sections of a print fabric and cut out. Half-Square Triangles - Dividing a square in half diagonally into two triangles. Hanging Sleeve - A tube of fabric sewn to the top edge of the quilt back, through which a hanging rod can be inserted. In-the-Ditch Quilting - A type of outline quilting that is done alongside a seam or an applique edge. Landscape - An applique method of layering fabrics to create a landscape picture. Lap Quilting - The process of quilting blocks or sections of a quilt before assembling them (see Quilt-As-You-Go). Long Arm - Machine quilting using a commercial long arm sewing machine. Long Half - A 22”x36” piece of fabric. Matching Point - The place at which seam lines meet, most often at corners. Meander Quilting - Random lines of stitching that usually do not cross over each other. Medallion Quilt - A quilt with a central motif as the focal point, surrounded by multiple borders. Motif - The main element or a repeated figure in a design. A central focal point in a medallion quilt or a quilted pattern in an alternate block. On-Point - A block arrangement in which a block is placed with its corners up and down and to the sides (see Diagonal Set). Origami - The Japanese art of paper-folding to create three dimensional shapes now used with fabric for a 3-D applique. The most often used shapes are flowers. Outline Quilting - Stitching that follows the outline of the patchwork or applique pattern. Panels - Fabric yardage with printed blocks to be cut out separately. 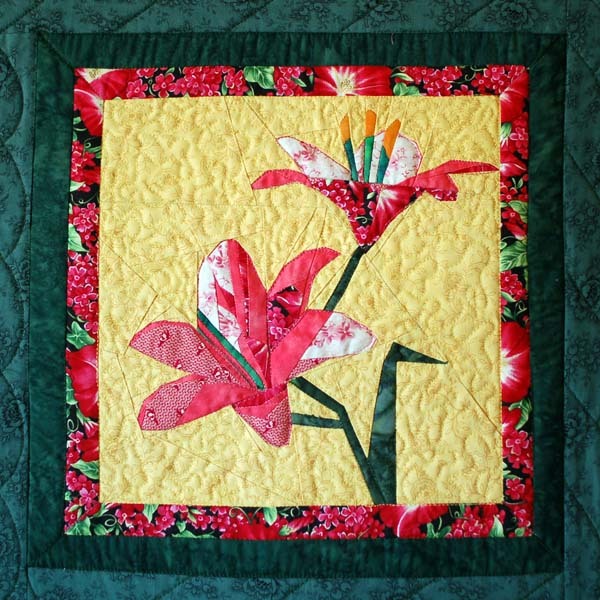 Pantograph - A commercial quilting method that uses one quilting pattern that repeats across all of the quilt regardless of patchwork seams or patterns. Paper Piecing - A technique of sewing fabric pieces with a paper foundation, which has a printed pattern to follow. The paper is then removed. Photo Transfer - A technique of transferring a photograph onto fabric. Pivot Points - A method used with set-in pieces whereby the stitches stop ¼” from the end of the piece with the machine needle in the down position. The piece is then pivoted to sew the next seams together beginning ¼” from beginning of new side. 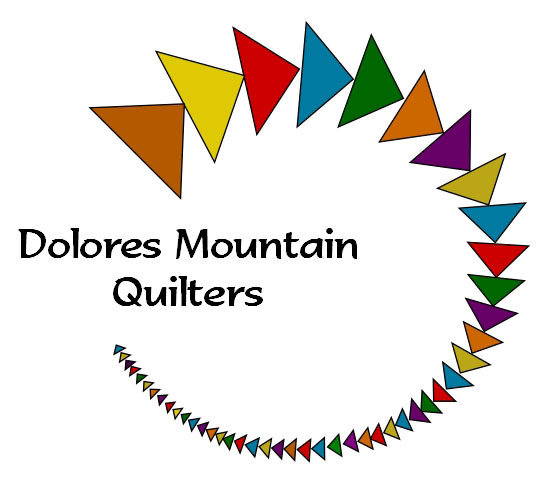 Quarter-inch Quilting - A type of outline quilting that is done ¼” from seams to avoid stitching through seam allowances. Quarter Square Triangle - Fabric squares that are divided diagonally in both directions into four triangles. Quilt-As-You-Go - See Lap Quilt. Quilting - The process of sewing together, by hand or by machine, the sandwiched quilt top, middle batting and back. Redwork - The art of embroidering stamped, white quilt blocks with red thread. Round Robin - The process of different quilters adding a specified border to another's quilt top until all rounds have been completed. Ruching - A fabric strip that has been tucked and gathered before being appliqued to the background fabric. Sandwich - The three layers that make up the quilt; the top, the batting, and the back. Sashiko - A form of decorative Japanese stitchery similar to quilting. Sashing - The fabric separating the blocks, framing them and making the quilt larger. There are two basic kinds of sashing; continuous sashing and sashing with squares. Sashing Squares - (Cornerstones) Squares of fabric set at block intersections between sashing strips. Seam Allowance - The margin of fabric between the seam and the raw edge, ¼” unless otherwise stated. Setting In - The process of stitching pieces into the openings between previously joined pieces. Setting Square - See Alternate Blocks. Setting Triangle - A triangle used to fill in the space between blocks along the sides of a diagonal-set quilt. Stash - (Really, you need a definition?) A private supply of fabric to eventually be used in a quilt. Stippling - Very closely stitched background quilting that can be done by hand or machine to create surface texture. This dense quilting flattens the background, which results in raising the motif it surrounds. Straight Set - A block arrangement in which the sides of the blocks run parallel to the sides of the quilt. Strip Piecing - A technique in which strips of fabric are cut and joined lengthwise to form a strip set (panel) of fabric strips that resemble striped fabric. Strip Set - A panel of two or more strips joined lengthwise to form one piece. Tone-On-Tone - A fabric with a small print or design in a tone similar to the background tone. It appears solid from a distance. Trapunto - A quilting technique that raises the quilting design in relief by stuffing from behind. Triangle Squares - A pieced square formed by joining two triangles at their hypotenuses. Wall Hanging - Any quilt, usually smaller than bed size, and used to decorate a wall. Warp - The threads that run the length of a woven fabric. Weft - The threads that run across the woven fabric. Whole Cloth Quilt - A quilt made from one large piece of fabric, usually a solid color, that is quilted only. Neither patchwork nor applique is used to decorate this quilt top. Window Framing - The process of sewing strips of fabric around all four sides of a quilt block, either for accent, to even the block sizes or to separate blocks instead of using sashing. Yo-Yo - A technique in which fabric circles are gathered and flattened to form rosettes or yo-yos. They can be individually stitched to a block but most often tacked together at their folded edges.